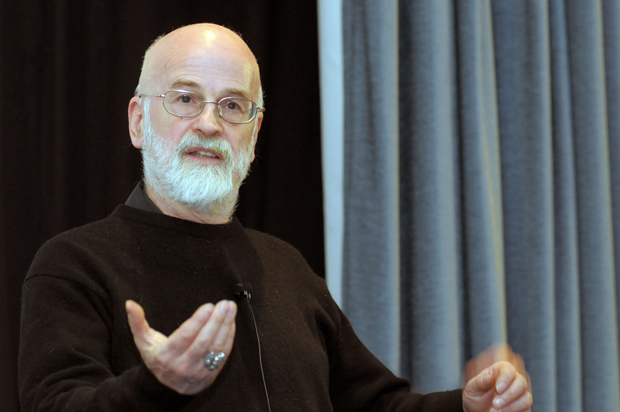 In 2008, Alzheimer’s Research UK’s late Patron Sir Terry Pratchett triggered a societal shift in attitudes towards dementia. On stage at the charity’s annual research conference, Sir Terry delivered a uniquely witty and affecting announcement of his own dementia diagnosis. Now, ahead of a docudrama looking back at his life, we’re sharing his words, which became a watershed moment for all people living with dementia. Interestingly enough, when I was diagnosed last December by those nice people at Addenbrooke’s (hospital in Cambridge), I started a very different journey through dementia. This one had much better scenery, interesting and often very attractive inhabitants, wonderful wildlife and many opportunities for excitement and adventure. Those of you who’s last experience with computer games was looking at Lara Croft’s buttocks might not be aware of how good they have become as audio and visual experiences, although I would concede that Lara’s buttocks were a visual experience in their own right. But in this case I was travelling through a country that was part of the huge computer game called Oblivion, which is so beautifully detailed that I have often ridden around it to enjoy the scenery and weather and have hardly bothered to kill anything at all. At the same time as I began exploring the wonderful Kingdom of Dementia, which is next door to the Kingdom of Mania, I was also experiencing the slightly more realistic experience of being a 59 year old who finds they have early-onset Alzheimer’s. Apparently I reacted to this situation in a reasonably typical way, with a sense of loss and abandonment with an incoherent, or perhaps I should say, violently coherent fury that made the Miltonic Lucifer’s rage against Heaven seem a bit miffed by comparison. That fire still burns. I want to go on writing! Admittedly, that means I have to stay alive. You can’t write books when you are dead, unless your name is L. Ron Hubbard. And so now I’m a game for real. It’s a nasty disease, surrounded by shadows and small, largely unseen tragedies. People don’t know what to say, unless they have had it in the family. People ask me why I announced that I had Alzheimer’s. My response was: why shouldn’t I? I remember when people died of “a long illness”, now we call cancer by its name, and as every wizard knows, once you have a thing’s real name you have the first step to its taming. We are at war with cancer, and we use that vocabulary. We battle, we are brave, we survive. And we have a large armaments industry. For those of us with early-onset in particular, it’s more of a series of skirmishes. My GP is helpful and patient, but I don’t have a specialist locally. The NHS kindly allows me to buy my own Aricept because I’m too young to have Alzheimer’s for free, a situation I’m okay with in a want-to-kick-a-politician-in-the-teeth kind of way. But, on the whole, you try to be your own doctor. The internet twangs night and day. I walk a lot and take more supplements than the Sunday papers. We talk to one another and compare regimes. Part of me lives in a world of new age remedies and science, and some of the science is a little like voodoo. But science was never an exact science, and personally I’d eat the arse out of a dead mole if it offered a fighting chance. Fortunately, I have the Greek Chorus to calm me down. Soon after I told the world, my website fell over and my PA had to spend the evening negotiating more bandwidth. I had more than 60,000 messages within the first few hours. Most of them were readers and well-wishers. Some of them wanted to sell me snake oil and I’m not necessarily going to dismiss all of these, as I have never found a rusty snake. But a large handful came from ‘experienced’ sufferers, successfully fighting a holding action, and various people in universities and research establishments who had, despite all expectations, risen to high places in their various professions even while being confirmed readers of my books. And they said; can we help? They are the Greek Chorus. Only two of them are known to each other and they give me their advice on various options that I suggest. They include a Wiccan, too. It’s a good idea to cover all the angles. And that is where I am, along with many others, scrabbling to stay ahead long enough to be there when the cure, which I suspect may be more like a regime, comes along. Say it will be soon –There’s nearly as many of us as there are cancer sufferers, and it looks as if the number of people with the disease will double within a generation. And in most cases alongside the sufferer you will find a spouse, suffering as much. It’s a shock and a shame, then, to find out that funding for research is three per cent of that which goes to find cancer cures. Perhaps that is why, for example, that I know three people who have successfully survived brain tumours but no-one who has beaten Alzheimer’s…although among the Greek Chorus are some who are giving it a hard time. I’d like a chance to die like my father did – of cancer, at 86 (remember, I’m speaking as a man with Alzheimer’s, which strips away your living self a bit at a time). Before he went to spend his last two weeks in a hospice he was bustling around the house, fixing things. He talked to us right up to the last few days, knowing who we were and who he was. Right now, I envy him. And there are thousands like me, except that they don’t get heard. So let’s shout something loud enough to hear. We need you and you need money. I’m giving you a million dollars. Spend it wisely. Back in Black will air at 9pm tonight on BBC Two. An amazing and moving speech by an amazing man, who at the time of delivering this speech still had more marbles than most of us have ever managed to win, steal or gather from our neighbours. Already in my 80s (I started early) this dreadful disease has taken a number of my friends and is the one that I fear most although seemingly not yet showing any sign of having. More strength to the Society’s elbow.